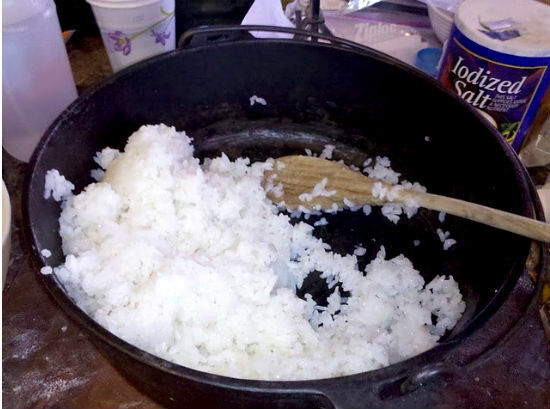 MarksBlackPot: Dutch Oven Recipes and Cooking: Sushi? In a Dutch Oven? OK, OK, technically, I only made the rice in my dutch oven. That’s really all you cook, anyway, right? But still, can you imagine making such an exotic meal out in the woods somewhere? It’s a cool thought! Brendon and I have made sushi about 7 or 8 times, now, indoors. I admit that, with that little bit of experience, we’re hardly expert chefs. But we’ve been able to make it work pretty well, and have created some good and simple rolls. Let me share with you what I’ve learned. I’ve learned that the process is as important as the ingredients. That begins all the way back even before I started cooking. I took three cups of Japanese short-grain rice and put it in a bowl. I filled it with water until the rice was well submerged, and stirred it and turned it with my hands. Instantly, the water became a murky white. After a few turns, it seemed it wasn’t getting any cloudier, so I carefully drained as much as I could without spilling the rice into the sink. Then I filled it back up with fresh water and swished and rinsed it again. And again. And again. I’ve never gotten it to the point where the water flowed completely clear, but I have been able to rinse it so that it was almost clear, or at least significantly clearer. I usually do it at least six or seven times. Finally, I put the rice in a strainer and let it sit over my sink for about a half hour. That’s when it’s ready to cook. While the rice is straining, I lit up my coals and let them get hot. I put the rice and the water into my 10” dutch oven, and set that on the coals with the lid on. I let it sit there for about 20 to 25 minutes. Normally, when I cook rice, I watch for venting steam, but this time I didn’t see any, so I had to carefully watch the clock. Keep in mind that the dutch oven has to heat up, too. I didn’t lift the lid at all. Once the rice time was done, I pulled it off the coals and set it aside. I didn’t lift the lid. It sat for quite some time, easily another 20 minutes. While that was finishing the final stages of cooking, I mixed the sweet vinagar ingredients in the 8”, and put that over some coals, uncovered. I stirred that, and let it dissolve to a low, rolling boil. Then I pulled it off and let it cool some. Combining the rice and the vinegar is an odd process. I dumped the rice into the non-metallic bowl. While slowly stirring the rice with the spoon/spatula, I would alternately use my other hand to pour in some of the vinegar mix, and fan away the moisture and steam. Stir, pour, fan, stir, pour, fan. Sometimes, when Brendon and I do this together, one of us fans while the other pours and stirs. If you’re using one of the traditional shallow wooden bowls, the wood will also help wick away some of the moisture in the rice. When it was all done, I was left with well-cooked rice, clinging to itself in clumps, with individual grains still visible. It had a delicious sweet and sour taste. This got set aside to get closer to room temperature.